In today's Favorite Things Friday I want to introduce you to my artist friend, Teena, over at Serendipitini.com. She has a great eye for art and makes the most stunning jewelry and decor! She is so much more than jewelry though, but I have to say that her use of recycled items, especially recycled glass turns out stunning no matter what she uses it for! Whether to treat yourself or for a gift, you should check it out, I promise you, no one else will show up to the party with the same jewelry! You WILL get people asking where you got it! The quality is outstanding, and every piece she will tell you exactly what it is made of! No worries on getting a "cheap" piece! You will love it! My Personal Favorites? 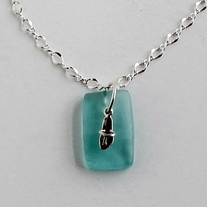 The Sea Glass with Flip Flop Charm Earrings and Necklaces! Perfect for your beach loving daughter or BFF! Jan's Tip: This would make PERFECT bridesmaids gift for your beach wedding! 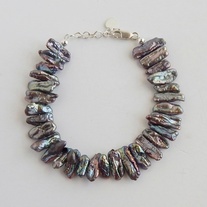 These peacock colored fresh water pearls are stunning and would go with any outfit from casual to dressy! Wonderful decor and gifts, including those that celebrate your favorite pet!